YOU CAN BUY A BIKE RIGHT NOW! This Online Vintage Bicycle Museum is a public internet database for fellow enthusiasts of vintage bicycles and tricycles. I’m not an expert, just a vintage vehicle enthusiast and collector with many old cycles. When I buy an old vehicle, I research its marque; it’s a great way to learn about 20th century social history. I find automobilia and ephemera at autojumbles and shows, and spend my spare time building websites to share what I’ve discovered. I hope this website may help by cross-referencing info and images to identify machines or parts …and also provide pleasure to all who enjoy vintage motoring as much as I do. Anyone can copy whatever they wish without asking me. If you’re feeling generous, perhaps you can add a credit and/or a link to this website. ‘Old Bike’ will always be a work in progress. I have other vehicle museum websites to research, maintain and update (as well, of course, as the vintage vehicles themselves). Even when typically atrocious British summer weather chains me to the computer rather than inspiring vintage motoring, motorcycling, scootering, cyclemotoring or pedalling around the Sussex hills, with the enormous piles of literature spread around this room begging to be added to my websites, I can’t see me ever catching up. My day job entails restoration and sales of vintage motorcycles and cars. I always have restorations on the go. As my bicycles are not for sale (though I do exchanges with other collectors), sales vehicles generally take precedence. The 1914 Golden Sunbeam Tricycle pictured above is an example of the unrestored condition we prefer. Nevertheless, some bikes are too far gone, and a repaint is the only option. 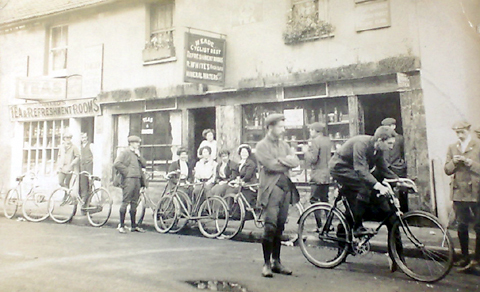 My good friend Pat, who lives in France, has restored many of the bikes you see here. We started pooling our resources years ago when we realized that what’s exotic to collectors in one location is more commonplace elsewhere. I send him fifties 3-speed gents bikes to restore and re-sell in France, and some old British bikes for his personal collection. In exchange I receive various French motorcycles and cyclemotors to re-sell, and German bikes that he’s restored for my personal collection. We spend more time doing this than may be healthy, but derive an enormous amount of pleasure from it. You’re welcome to email me. I hope you enjoy this site. UPDATE: Since setting up this website, I’ve noticed an increasing interest among younger enthusiasts for motorized bicycles, clip-ons and cycle attachment engines. That’s been my main area of interest and specialization for many years, so I’ve now added more of my cyclemotors and BMA’s to this website for varied interest.